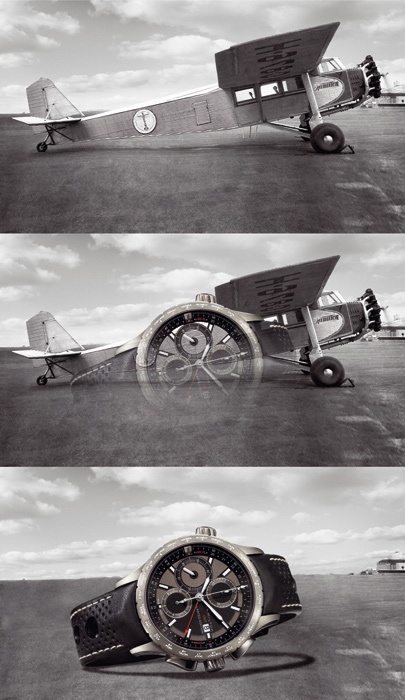 Biel, January 2010 – The Khaki X-Landing takes the emotions on a nostalgic journey back to the first all-metal aircraft of the 1920s, and the rationale on a trip co-piloted by a feature for measuring the top of descent (TOD). The Khaki X-Landing provides pilots with precision and style in a sophisticated GMT chronograph, with design touches reflecting the materials and structures of the early metal planes. This duo of limited edition watches passionately tells the story of an aviation tradition in the language of today. The TOD marks the transition from the cruise phase of a flight to the descent phase. Pilot wearers simply mark the aircraft’s cruising altitude in feet at the 9 o’clock position, using the crown located at 10 o’clock. Integrating a standard descent angle of 3°, the Khaki X-Landing then reveals the number of nautical miles before the final destination that marks the start of the optimal descent in a small, dedicated window. 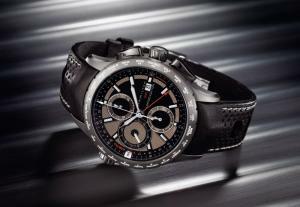 The language of aviation continues on the bezel’s surface where 24 different time zones are printed. On one model these are represented by place names, on the others by terms from the military or name time zones, appealingly taking in hotel, tango and whiskey. True to form, the brand with a long and proven aviation history, demonstrates an astute eye for detail in all of the Khaki X-Landing pieces. One model has a distinctive dark grey PVD case that complements the predominantly black and white color scheme and contrasts with a red GMT hand. Sections of its dial resemble the corrugated metal panels of the aircraft that took to the skies in the 1920s and 1930s. True class is certified visually by an elegant integrated black leather strap reminding of traditional sporty perforated gloves with holes of different sizes. The other version, with an impressive round-the-world tour logged around the bezel, has a brushed stainless steel case and choice of metal or integrated brown leather attachment. Subtle touches of red add dynamism, standing out against the dial’s background with a woven metal effect that catches the light as the sky makes sure it has the final word. Hamilton was founded in 1892 in Lancaster, Pennsylvania, USA. Hamilton watches combine the American spirit with the unrivalled precision of the latest Swiss movements and technologies. Known for its innovative design, Hamilton has a strong foothold in Hollywood, with products appearing in over 350 films. The brand also boasts a strong aeronautical heritage. Hamilton is a member of the Swatch group, the largest watch manufacturer and distributor in the world with 160 production sites in Switzerland.